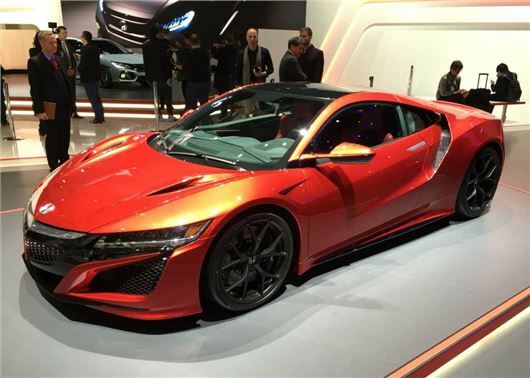 The new Honda NSX will cost £130,000, the company has confirmed at the Geneva Motor Show. Deliveries start autumn this year, but you can order one now. That price puts it bang in the middle ground of the £120,000 Audi R8 and £135,000 Audi R8 Plus. Honda says the NSX “challenges prevailing beliefs about supercars as much as the first generation did a quarter of a century ago,” but that it features, “classic low and wide proportions," much like any other supercar. Grammar sticklers look away now, because it will also, says Honda, bring a ‘New Sports eXperience’. If only more words began with X. Despite its classic proportions and pricetag, the Honda should bring something remarkable to the sub-supercar segment (anyone with a Ferrari will tell you that the NSX is not really a supercar) - a segment currently occupied by the aforementioned Audi and a Porsche 911 or two. Featuring a twin-turbo V6 engine linked to a nine-speed twin-clutch automatic and three electric motors, the NSX is a hybrid rear-wheel drive super-coupe that’s being hand built in America and should break 0-62mph in under three seconds. In that context, the price looks good value, especially given Honda is already promising otherworldly dynamics from the cutting edge setup.